Construction on E. Cherry Street has limited parking for people trying to access the US Post Office. Post photo by L. Allen. For residents who have been dodging construction and trying to find a place to park so they can access the US Post Office on Cherry Street, there is light at the end of the tunnel. According to Cedar Springs DPW Director Tom Stressman, paving will soon begin on Cherry Street, and the public should be able to access it by the middle of next week. “We wanted it done before Red Flannel Days,” he noted. Beech Street is also currently being paved and should be drivable within a couple of days. It’s been two months since construction started on the city’s antiquated sewer lines. Phase one of the project started with E. Cherry Street, and runs to just east of Park Street, and then south on Park to Ash Street. 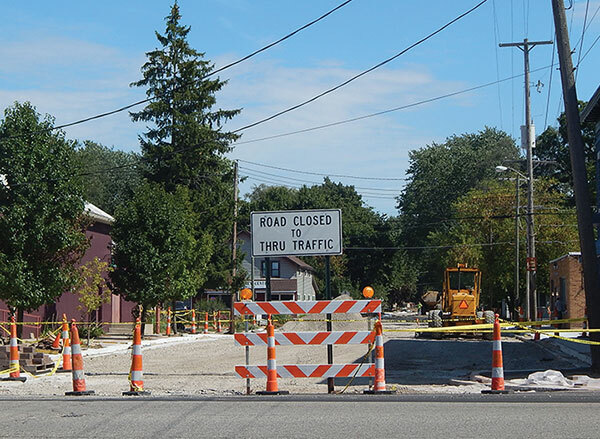 Phase 2 of the project is reconstruction of Ash Street, from Park Street to Ann Street, Ann Street from Ash to Beech Street, and Linda Street from the Beech Street intersection. Phases 1 and 2 included removing the existing road surface, aggregate base and sub-base, and installing new sanitary sewer, storm sewer and water main and reconnection of sewer and water services. Phase 3 is main construction along Muskegon Street from Red Hawk Drive to the well fields. Phase 4 includes sanitary sewer lining and spot repairs around the city. One of the main reasons for the reconstruction project was to minimize groundwater infiltration to the sewer. “We were treating so much groundwater at the plant, and it has significantly dropped just since some of the repairs have been made,” explained Stressman. He said people should be able to get around easily during Red Flannel Day. The project is supposed to be done by November.